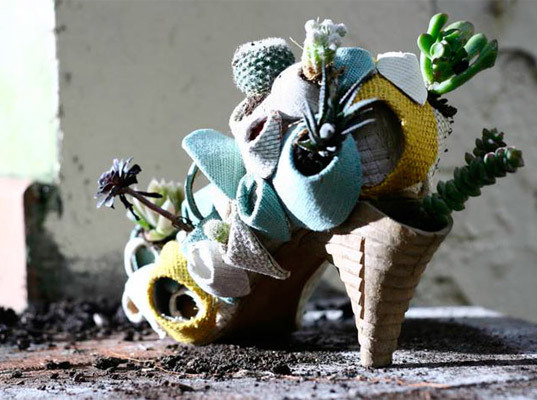 Part footwear, part foliage, Carmel Walsh’s botanical-infused shoes were made for walking…and talking about. The Tuscany-based designer enlisted the help of a local wood restorer to carve the walnut mid-heel soles, which she then plied with a population of succulent-sprouting “barnacles” made from vegetable-tanned leather, organic cotton, linen, hemp, and cork. Change the plants, not shoes, from season to season. For shoe buffs with a yen for novelty, Walsh has an intriguing solution: Change the plants, not shoes, from season to season. Not convinced? Give the idea time. It just might grow on you. These are the most stunning shoes I have ever laid eyes on. Love the concept. Love succulents. Love!!! Walsh, I've sent to www.shuzsociety.com too!